Lots of people have digital cameras but don’t know how to use them yet. That’s nothing to be ashamed of, digital photography can be complicated! But, with a few clever techniques, you can learn how to take truly incredible photos. This free course will teach you the most important functions and techniques of digital photography including the Rule of Thirds, your DSLR, and your crop sensors, getting you one step closer to taking the perfect shot. With this short course you'll learn everything you need to unlock your camera. You’ll be introduced to the basic features of digital cameras so you can finally know what all those buttons actually do. Using simple language, the course explains the differences between full frame and crop sensors, and shows you how digital photos are processed into file formats such as RAW and jpeg. You will then learn how to identify the key parts of a DSLR and how to understand each of the settings on a DSLR. 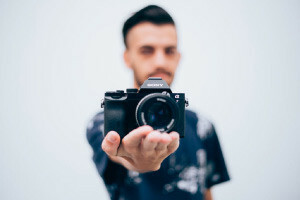 You will then be guided through different styles and techniques of photography such as landscape photography, street photography, and wildlife photography, so that you can decide what style interests you most and start developing your own. To bring you to an even more professional level, you’ll learn about the works of key photographers and the early history of photography. You’ll then learn about the Rule of Thirds, the essential equipment needed for a photo shoot, and how to identify the key attributes of different types of image files. Photography can be inspiring, and with photography skills you can capture those really wonderful moments forever. But more importantly, taking a cool photo is just good fun! And it really is less complicated than you think, this course can introduce you to so much in just 3 hours. These are skills you can use any day for the rest of your life, even to start your career as a professional photographer. So, get beyond the automatic setting on your camera today. Discuss the origins and early history of photography. Identify the works of key photographers. Define the Rule of Thirds. Identify the various parts of a DSLR. Describe the function of each of the settings on a DSLR. Discuss the importance of good file management and photo management systems. List the meaning of the Creative Commons icons as applied to photography. List key the equipment needed for a photo shoot. Explain how the sensors work in a DSLR. Discuss the difference between Full Frame and Crop Sensor. Identify the key attributes of the various types of image files.